When I was in school (public) we began instrument lessons in fourth grade (I was the most terrible clarinet you've ever heard, demonstrating early on my complete lack of rhythm or musical talent) and had a year of chorus in fifth grade. Around Christmas that year, we sang a song that caused some parents to pull their kids out of the class (temporarily). I remembered the words, which were Latin, because they were really drilled into our heads, even though I didn't understand what they meant at the time. 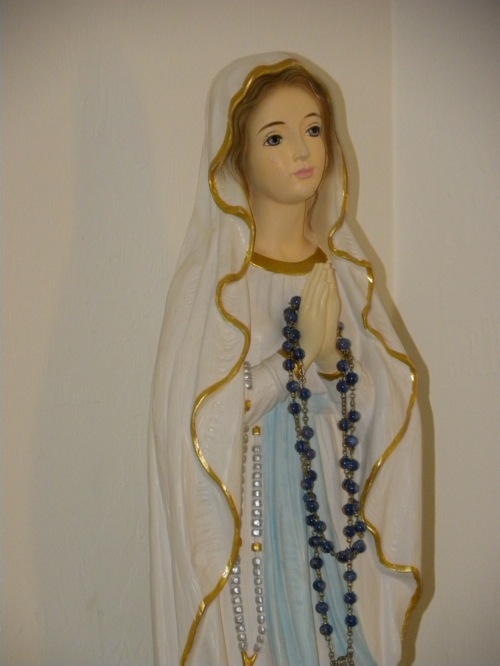 When I first became Catholic, not quite five years ago, I was surprised when I first heard a Hail Mary in Latin, because I had always thought that that was what we were saying, since the song began with Ave and had the word Maria in it too. on the cross for mankind..."
have mercy on me. Amen." Out of all the songs we sang, this is the only one that hasn't faded and completely disappeared with time. I can't imagine a public school singing it now a days, even with the ability for parents to opt out... yet I'm very glad that I know it, and that I was humming it to myself and occasionally singing it, all these years. The wikipedia page says that "The poem is a meditation on the Catholic belief in Jesus' Real Presence in the sacrament of the Eucharist, and ties it to the Catholic conception of the redemptive meaning of suffering in the life of all believers. Yes... I can't imagine a song I would rather have had echoing around in my head for the last nearly two decades. Thank you to Cliff for finding the clip! Dear Cammie, this is positively one of your most touching posts. Now, be a good little blogger and add the music. Merry Christmas! I'm glad you are enjoying your time with Paul. I just added it Cliff! Thank you for the link (and the compliment!)! I know exactly what you mean in my choir classes we did a lot of old Latin songs especially around Christmas time, but I had no idea what they meant until now. In school (Public) we sang many "Catholic" songs. Our Choir director wasn't even Catholic. If your going to sing anything before a certain time period they will have a tendency to be Catholic. I am glad that you kept that song in your heart even if you had no idea what it was really about. By the way, that song was sang at my wedding during communion. It's one of my favorite Catholic hymns. Almost all of my wedding music was in Latin. We did the "Mass of the Angles". Indeed, when I was in choir, (middle and high school) we sang all kinds of old Catholic songs. In high school we sang an entire Mass (Haydn's "Little Organ Mass" Missa brevis Sancti Joannis de Deo). Of course Choir at this point was an elective. But music like this can always be approached in a historical, and cultural context like a good musicians always should.